A few weeks ago, Lakers head coach Luke Walton declared that he doesn’t believe in tanking as a viable strategy for an NBA team. That’s his personal belief and he’s welcome to hold it within his heart. Over the next two months, he may find members of his team’s front office feel quite differently, as the Lakers are about to embark on one of the the most tenuous draft pick situations in recent memory. The trades turned out to be disasters, with head coach Mike Brown fired FIVE GAMES into the season. 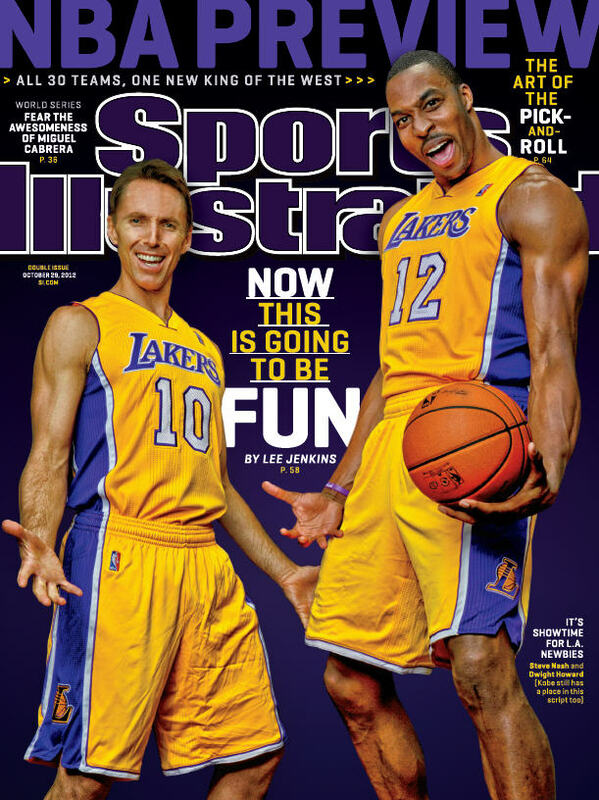 Nash only played 60 games as a Laker and Howard never meshed with Kobe Bryant. More importantly for today’s Lakers, draft picks were shipped to Orlando and Phoenix in the deals to acquire Nash and Howard. Phoenix acquired the Lakers 2015 first round pick, if it fell outside the top 5 (with that protection falling to top 3 in 2016 and 2017 and then being removed for the 2018 draft). In their efforts to reach the playoffs, Phoenix swapped the pick at the 2015 trade deadline. As young point guards flew around the league, Brandon Knight landed with the Suns and the Sixers nabbed the Lakers pick. Los Angeles has been lucky to fall within the pick’s protection each of the first two years, so it has yet to convey to Philadelphia. An army of Process Trusters wait with baited breath. An NBA rule named after former Cavaliers owner Ted Stepien forbids teams from trading their first round pick in back to back drafts, so the Lakers had to get creative when dealing for Dwight Howard. Technically, they traded a 2017 first round pick, but because of the Stepien Rule, the pick would actually be sent two years after they conveyed the pick from the Nash trade. Thanks to the protections on the pick sent to Phoenix (then Philly), the date on this pick changed as well. But, Los Angeles has a safety valve here. If the Nash pick doesn’t convey in 2017, the Howard pick is replaced by second round picks in 2017 and 2018. Ok, deep breath. What does all that mean? If the Lakers do not fall in the top 3 of this year’s draft, they send their 2017 pick to the Sixers and their 2019 pick to the Magic. If the Lakers do fall in the top three of the draft, they’ll send next year’s pick to the Sixers and two second round picks to the Magic. That is a monumental difference. As a team in a rebuild, the Lakers can’t afford to miss out on this year’s deep draft class. Beyond that, the difference between the 2019 first round pick heading to Orlando versus two second round picks is obviously gaping and drastic. It would absolutely behoove the Lakers to do everything they can to lock in a top 3 pick in May’s lottery. The Lakers are in that coveted third spot, though the ping pong balls would only give them 47 percent chance at holding that spot. Sitting right behind LA, the two teams gunning for that pick protection to fail this season, Orlando and Philadelphia. The Magic should be all over the phones in the 9 days left before the trade deadline trying to ship out Serge Ibaka or any other player they don’t see as part of their future, but who is currently helping them win. Wins are poisonous for Orlando down the stretch, with no prayer of a playoff spot (or building a contender around their current core). Right behind Orlando are the Sixers, licking their chops like a hungry pitbull. During the final month of the season, expect to see very light schedules for Ben Simmons and Joel Embiid, recovering from injuries. When Philly plays a back-to-back, I expect both rookies to play together, with the second game on that slate being punted away as a possible loss (Don’t tell Dario Saric or TJ McConnell though). So there’s about 700 words that raise one simple question: Are you sure you don’t want to tank, Luke Walton? Book it Shane, Lakers will get a top 3 lottery pix. NBA HQ I’ll make sure. I’d fully expect the conspiracy theorists the yell and scream if that’s the case. Sixers aren’t fully tanking. If they were they’d start Okafor and play him in last 5 minutes. They’d also do the same with Sergio Rodriguez. I think the Sixers are comfortable not tanking, knowing they get the Lakers pick this year or next year regardless. LA and Orlando should both be trying to crash and burn.